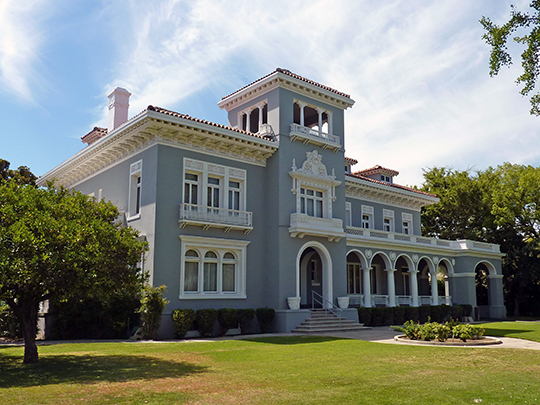 Photo: H. H. Brix Mansion, ca. 1910, 2844 Fresno Street, Fresno, CA. Listed on the National Register of Historic Places in 1983. Photographed by User:Bobak Ha'Eri (own work), 2009, [cc-by-3.0 (creativecommons.org/licenses/by/3.0)], via Wikimedia Commons, accessed January, 2014. Fresno County administrative offices are located at 2281 Tulare Street, Fresno, CA 93721; phone: 559-600-5956. The county was created in 1856 from parts of Mariposa, Merced and Tulare counties. The name Fresno is Spanish for Ash Tree, local shrubbery found along the San Joaquin River. The original county seat was the river town of Millerton, but was moved to Fresno soon after the Southern Pacific Railroad line built a station there.